Recent wave of demolitions makes us realize how physically temporary lives of Palestinians are. This temporariness seems be in the weird way ingrained in the Palestinian existence. Being born with ‘a Palestinian condition’ means that nothing can be taken for granted, nothing is for sure. Perhaps this is why Palestinian families we meet are so bloody resilient to the terrible forms of displacement they are experiencing. In some cruel way they are prone to dispossession that continues to happen. They are born with the amazing ability to sustain and re - emerge no matter how demolished and framgemnted their lives can become. 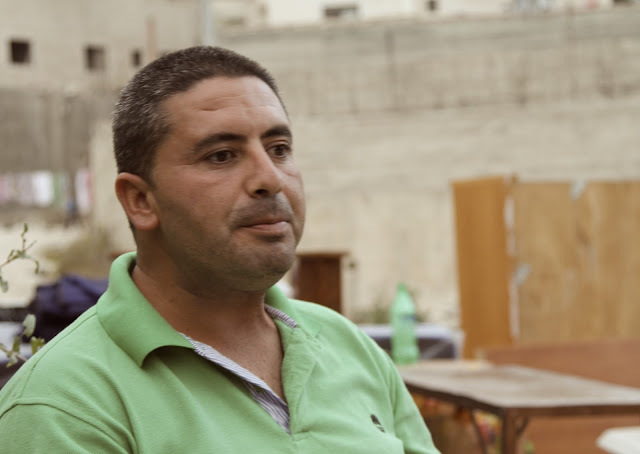 But looking at Abu Laban’s destroyed life it is difficult to imagine how he will be able to put together all these broken pieces of his livelihood. Emad Abu Laban’s house was demolished on Monday morning. Just as he and his wife left for work. When he got back few minutes later his house was already turned down and the bulldozers were finishing demolishing the fence. As he tried to demand why his house was being destroyed, he was pushed away by the police and armed security forces. Documents, valuable belongings, his wife’s jewelry, objects of family memory - all their possessions were gone under the ruins. All his life. In 15 minutes. He had received no demolition order or he was not aware of it as demolition orders are not delivered to the owner, but to the structure. He had been not aware of the imminent threat. Look, me and my wife, we are not rich. We built just a small 1 storey house, thirtysomething square meters on my mother’s land. Nothing like these huge villas that surround us. I was hoping our little house would be safe. He lost everything. Even the plants that he carefully seeded were broken. I understand the house. But what did my trees do wrong to the Israeli government? Abu Laban has been living in the Mount of Olives for generations. As opposed to many other families that moved to At Tour in order to live within the borders of Jerusalem municipality and had their second homes somewhere else, he does not have this back - up cushion. The house he lost was all he had. The fact that Abu Laban’s house is within Jerusalem municipality borders makes his case specifically difficult. Being of the annexed East Jerusalem this neighbourhood is under full Israeli control. Which makes it very difficult for aid workers and humanitarian assistance to help. Everything needs to be agreed and coordinated with Israel and Israel is not particularly interested in rebuilding the structures that the authorities had just demolished. The demolition policy is undertaken as part of the Jerusalem Master Plan agenda which aims at securing Jewish majority of Jerusalem at the proportion 70:30. In order to achieve this Palestinians in East Jerusalem are being quietly, but strategically displaced and dispossessed.